This is a life saver. And it could be your life that it saves. 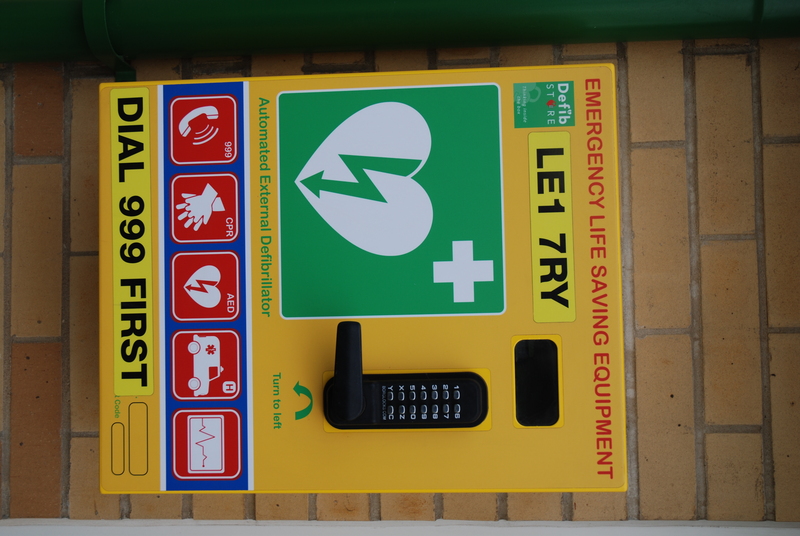 This is the defibrillator on Victoria Park. It is attached to the external wall of the new toilet block in the pavilion area, and is accessible 24 hours a day. There is another one in the park lodge offices which is available when the lodge is open. (There is also one one the wall of the Co-op on Clarendon Park Road).We’ve also asked whether one could be provided on the park at the Queen’s Road entrance which would be nearer the sports pitches and also the busy shopping area. It’s a good idea to know where they are, what they do, and how to use them. You could save somebody’s life, or somebody could save yours. A defibrillator is a device that gives a high energy electric shock to the heart through the chest wall to someone who is in cardiac arrest. This is to stop the irregular rythym of the heart in cardiac arrest, and allow the the heart’s natural pacemaker to restart the natural rhythm. A defrillator may also be called an AED, which means Automated External Defibrillator. They are called automated because once attached to the person who is in cardiac arrest, they test to see if they should be shocked, and then voice instructions guide you through the steps you need to take. If someone is in cardiac arrest and unconscious and not breathing, or not breathing normally, then CPR (cardiopulmonary resuscitation) should be used until a defibrillator becomes available. CPR is chest compression to maintain an oxygen supply to the brain. CPR is for when someone is unconscious and not breathing, or not breathing normally. The chance of surviving a cardiac arrest falls by 10 per cent for every minute that passes without CPR or the use of a defibrillator. This is why it’s a good idea to know what to do, and how to use a defibrillator. How do I use a defribrillator? The first thing you need is access to the defibrillator. You may need to give CPR until you have a defibrillator so get someone to the place where it is as quickly as possible. When there call 999 and the emergency services will provide a code number to open the cabinet. Get the machine to the person needing it as quickly as possible. Then follow the instructions on the machine. Once turned on it will guide you through what you need to do. The best thing is to go on a training course which willl teach you how to do CPR and how to use a defibrillator. It only takes a couple of hours, it’s completely free, and once you’ve done it you will know how to save a life. I’ve just done the training, and the more people who do it the better the chances everyone has of surviving a cardiac arrest. To find out more about the training and what I did just follow this link. ← Just Saved This Guy’s Life!